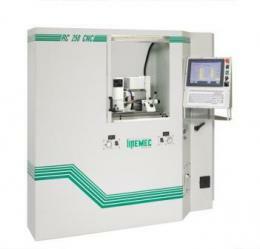 Evolution of the RC250 cycled, this new cylindrical grinder is ideal for the manufacture of tools in small series. The CNC numerical control from this grinder internal/external with predefined cycles conversational, also provides access to profiles in Code Iso, by allowing linear and circular interpolations from axes. With its new grinding-wheel Headstock, motorized with a Brushless powerful engine, and thanks to specific cycles, this grinder is particularly suitable for machining carbide tools.